You may sometimes notice some specks or clouds moving in your central and/or peripheral vision. These are sometimes described by patients as “cobwebs” or “spider webs”, or more often called floaters. Floaters are clumps of vitreous fibers or vitreous gel floating inside the vitreous cavity. These fibers start to appear when we get older, approximately after 45 years of age, or sooner if there are some ocular conditions, such as high myopia or nearsightedness. These are due to the shrinking or thickening of the vitreous gel, resulting in a separation or detachment of the vitreous gel from the retinal surface. This process is called posterior vitreous detachment (PVD). The resultant clumps or strands of vitreous fibers become visible by the patient. 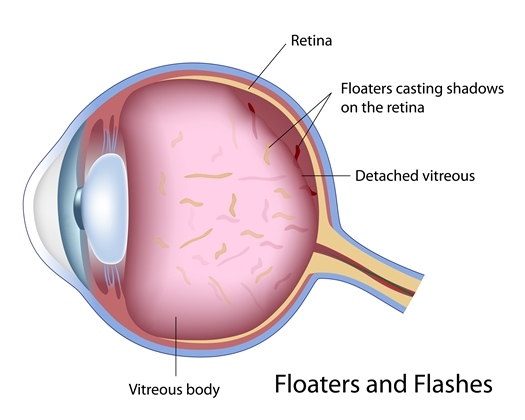 Sometimes, floaters can be the result of hemorrhages inside the vitreous cavity caused by rupture of small retinal blood vessels due to vitreous traction, or by some other diseases such as Diabetic Retinopathy. Dilated retinal examination is necessary to identify the cause. Flashes are the results of rubbing or pulling of the retina by the vitreous gel. You may see what look like flashing lights or lightning streaks, even when your eyes are closed. Flashes and floaters may be more easily seen under dim lit conditions, while less noticeable in a bright environment. These phenomena may make some people think the floaters and/or flashes are only present under certain circumstances, but actually they can be present all the time even though you may not notice them. Flashes and floaters may last for several weeks, months, or even years, and then fade over time. No treatment for the flashes and floaters is necessary if there are no associated complications. Surgical removal of floaters by vitrectomy is generally not considered worth the risk. As described above, flashes and floaters are an indication of PVD. Since the process of PVD involves the pulling and rubbing of the vitreous on the retina, the major risk or complication is a resultant retinal tear, which can subsequently develop into a retinal detachment. A retinal detachment can lead to severe loss of vision. Another complication of PVD is vitreous hemorrhage, with or without a retinal tear. Vitreous hemorrhage is caused by a broken retinal blood vessel as a result of the pulling of the vitreous gel. Therefore, it is important to have your retina examined thoroughly when you have new or increased symptoms of flashes or floaters. If a retinal tear, with or without retinal detachment, is discovered at an early stage, a retinal specialist can treat it in the office with laser or cryo-therapy (freezing) with or without a gas bubble placement. If the retinal detachment becomes complicated, a vitrectomy and/or scleral buckle surgery may be needed, which will be done in an operating room. It is important to understand that sometimes you may see less or even no floaters or flashes, the rubbing and pulling of the retina by the vitreous gel may continue and the risk of a retinal tear is still present. It is also important to understand that people cannot tell if there is a small retinal tear in the peripheral retina, which may cause a retinal detachment later on. Therefore, follow-up retinal exams are necessary.